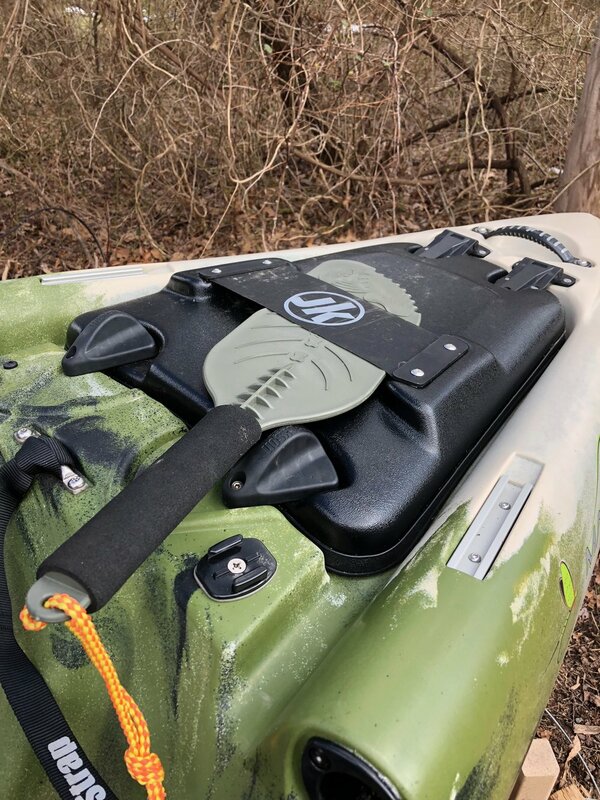 In a (not so) recent post, I did a review of the Jackson Mayfly Kayak. The Mayfly is a kayak that was designed from the ground up as a fly fishing platform. The boat ships from the factory very nicely equipped, but l found that adding a few extras enhanced the fishing abilities of this boat. I have decided to produce a series of blog posts on the additional rigging I have done on this kayak to make it the ultimate warm water fly fishing platform, at least for my needs. If you want to read the original review which goes over all of the features of this great kayak you can find it by clicking on the button below. One of the great features of this boat is that it comes equipped with a ton of storage space. 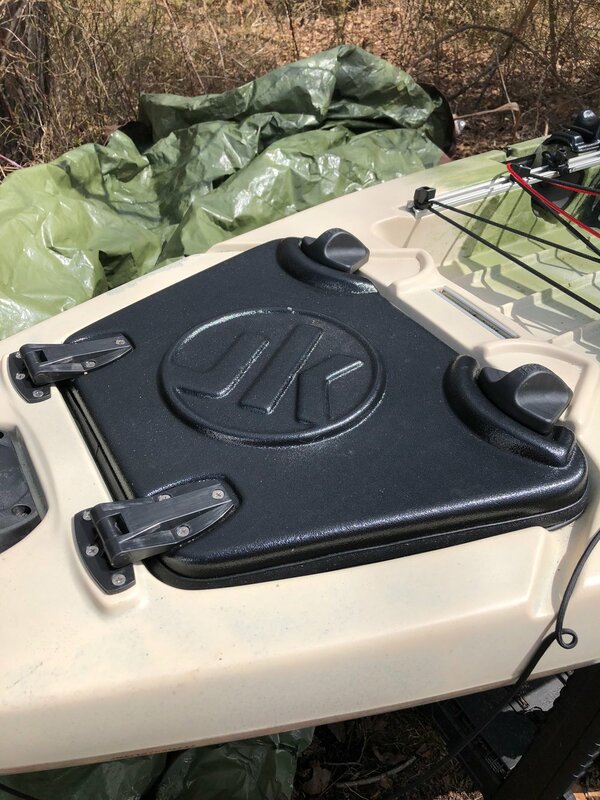 In addition to the two cavernous storage areas under the bow and stern hatches, there are molded-in storage compartments for fly boxes, a seat with built-in storage for tackle boxes and tools and large waterproof seat back pouch. You can also store two fully rigged nine foot fly rods, with their tips protected, onboard. With all this available storage do you need more? Probably not, but if you're looking to organize your gear for easy access, then you can always make improvements. The forward hatch, note the paddle sleeve and the dual latches. The forward hatch has a removable tray that is perfect for storing smaller items that would get lost in the hold. There is plenty of room under the tray for larger items. 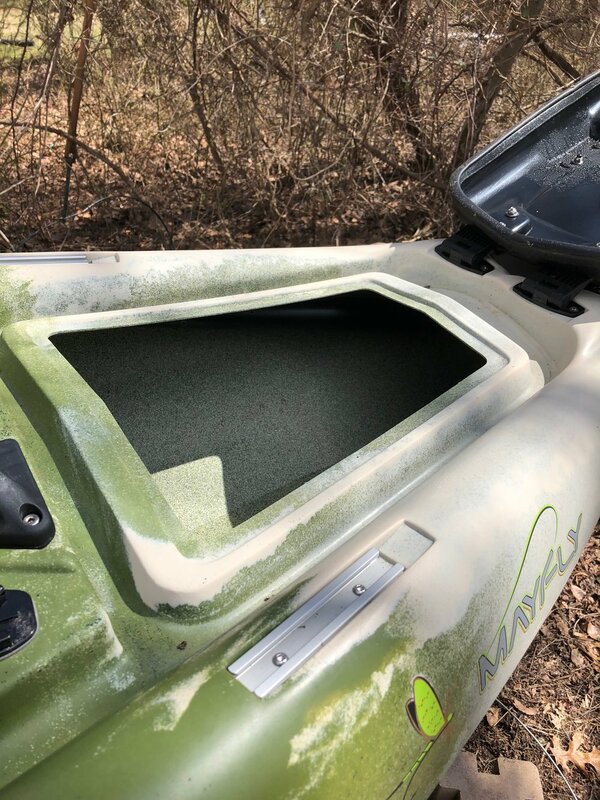 The stern of the kayak also has a large storage area covered with a water tight (not proof) lid, secured with two latches. Built in storage for fly boxes. In addition to holding few fly boxes, each storage compartment has a fly patch on the lid for storing or drying flies. 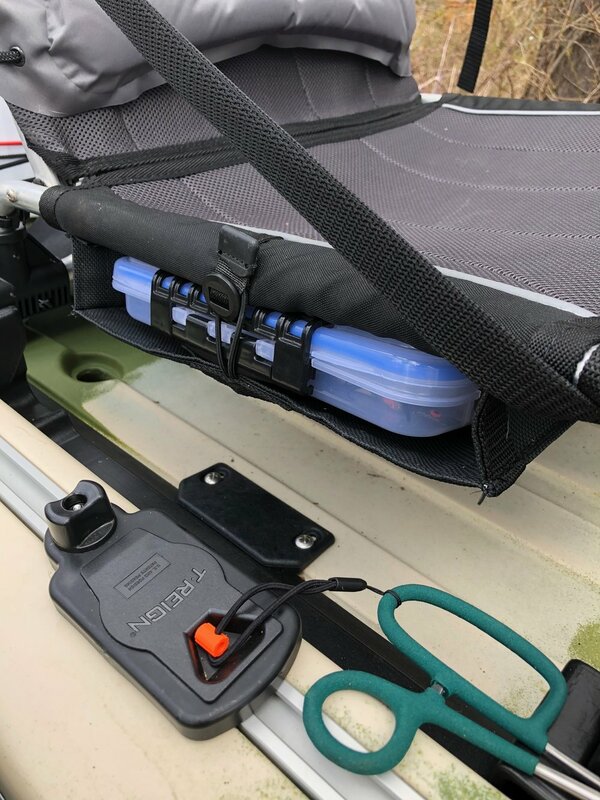 For 2018 Jackson Kayak announced a sliding storage tray that mounts under the seat. I often store items under the seat, especially when it is the seat is in it’s highest position. The 2018 models that are compatible with this new storage tray have an additional rail mounted under the seat to accept this sliding tray. Unfortunately, my kayak being a previous model is not equipped with the gear track, but I picked up the tray all the same. It fits under the seat perfectly and allows me to keep items off the deck where they sometimes get wet. If I need to, I can always install a track to permanently mount the tray, but for now, it just sits under the seat and works just fine. The seat itself also has built in storage. Each boat shipped with a waterproof storage bag that mounts to the back of the seat. The seat has three storage areas on its underside for storing tackle boxes or other flat items. There is one large compartment on each side and a small one in the front of the seat. The under the seat, sliding tray is a handy place to store frequently reached for items. Under the seat storage for large tackle/fly boxes. The first addition to kayak to increase storage, was a crate system for behind the seat. Crates make it easy to store tackle, fishing accessories, tools water, food, and other supplies such as bug dope and sunscreen. While you could put all of these items in one of the covered hatches, having them in a crate makes them easy to access. Just reach behind you while seated and grab what you need out of the box. For the first season, I just threw my Plano Guide bag behind the seat and loose items were stored where ever I could stash them. Next I upgraded to your basic milk crate. It was easy to fasten down, and it held everything I needed. The milk crate is a simple, economical solution to storage but it is not without its problems. The open design of a milk crate does not protect its contents from environmental conditions such as sun, wind, and rain. On more than one occasion the contents of the box were drenched when I found my self caught out in a shower. While out on a particularly windy day I once had to paddle clear across a lake to retrieve a Tiley hat that had blown out of the open crate. After a season of being exposed to the effects of the sun, I noticed some of my flies that were stored in clear Plano tackle boxes were starting to bleach out a little, so it was time to make a change. Also, I have always been concerned about the safety of the items stored in the crate in the unlikely event I manage to flip this kayak. If the boat flipped everything stored in the open container would be lost. I researched many different crate systems and was immediately taken back by the prices being asked for what is essentially a plastic box! I was looking for something that provided some protection from the elements (but need not be totally waterproof), had a lid that could be secured thus protecting the contents from the elements, and in the event things went south, could be easily secured to the storage well of the boat and remain closed during a capsize. I was also looking for the ability for the box to be easily customized as my needs change. The YakAttack BlackPak addressed all these concerns. The single issue with this product was the cost. Retailing for $130.00 the price seemed extreme to say the least! We are talking about a plastic box here! Other manufacturers offered storage options at comparable prices, in some cases even more expensive, but none had all the features of the BlackPak. Because of the cost, I initially decided to stick with my milk crate, but I stumbled upon a great deal on a 2018 (yes, it is a plastic box with a model year!) tan colored BlackPak. It was a great price, but it was still more than I wanted to pay for a plastic box. However, I took a chance and purchased it. I have to admit that I love this product! It is exceptionally well made, it feels very sturdy, and is more than capable of standing up to any abuse I will give it. It answered all of my storage needs and can be customized far beyond anything I will ever ask of it. The box behind the seat is the Black Pak. An expensive but versatile way to store your gear while keeping it readily accessible. What puts this box at the top of my list is the customization features. The box comes with a myriad of pre-drilled holes that allow for the mounting of a whole host of accessories. The BlackPak ships with three standard rod holders, but being a fly fisherman, they will not see much use. However, I am considering using at least one of them as a net holder. These pre-drilled holes will allow me to mount holders for pliers, fish grips, a flashlight and other items that need to be kept out of the way but readily accessible. The top of the box is equipped with holes that will accept standard gear rails for even more customization. One complaint I have heard about this box is the use of bungee cords to act as hinges and a method to secure the lid. I for one like this feature. In many box systems hinges are a point of potential failure. They are all destined to fail at some point, and then you left with an unusable product. In the unlikely event, I wear out one of these cords, they can cheaply and easily be replaced. Except for the overall cost, I only have one other issue with this product. I have a hard time referring to this box as a BlackPak, but TanPak just doesn’t have the same ring to it. I rounded out my storage needs by adding retractors to the gear tracks along side the seat to hold items like forceps, pliers and fish grips. The bar at the base of the seat is a handy place to hold spools of tippet and my nippers mounted to a retractor. This makes all these items instantly accessible but out of the way and secure. I have also added a few adhesive backed fly patches to the hull near the seat area to dry off and store flies so I don’t have to keep opening and closing hatches. I like to be as stealthy as possible on the water and this eliminates the noise made by fumbling around with the compartments and hatches. After all this there is even room left over for a small cooler! You may not need to go to all this trouble as the Jackson Mayfly is ready to fish right out of the box. I, like many anglers, probably carry too much gear on the water. I like to be prepared for what ever comes my way and still have room for lunch and a few drinks. Next up will be a review of the anchor systems I have installed on the kayak. Yes I said “systems”, there are more than one. Hopefully you will not have to wait a year to read that one!